The NYC Postdoc Coalition (NYCPC) was formed with the goal of connecting postdoc associations throughout New York City. The group got its start following the 2016 National Postdoctoral Association (NPA) meeting that connected Dr. Yalda Moayedi of Columbia University, Drs. Alison Sanders and Albino Troilo of Icahn School of Medicine at Mount Sinai, and Drs. Niki Athanasiadou and Yelena Bernadskaya of NYU. While all institutes had internal postdoc associations they had little contact with one another. After a brief discussion they agreed there was need for an umbrella group run by the postdocs for the postdocs and that joining forces with other institute would take advantage of the unique setting of NYC as a major research hub. The inaugural meeting of NYCPC was held in March 2016 with six universities represented. The NYCPC is now comprised of postdoctoral leaders representing over 4,000 postdoc constituents from Weill Cornell Medical College, Columbia University, New York University, Icahn School of Medicine at Mount Sinai, Rockefeller University, Albert Einstein Medical School, and the Memorial Sloan Kettering Cancer Center. The Coalition’s overall mission is to improve the living and working conditions of postdocs and to help share resources, ideas, and support in advocacy efforts. The immediate benefit of forming the NYCPC was the ability to share information about institutional policies that helped postdocs negotiate within their own universities. Following a brief survey on housing, salaries, and benefits Mount Sinai postdocs were able to use the information to advocate for a new base salary. The coalition also kept abreast of developments regarding the FLSA and has compiled a list of NYC reactions regarding the new ruling, now under injunction. We are happy to note that all universities currently represented in the NYCPC are matching/exceeding the FLSA/NIH minimum. The NYCPC will present their work at the March 2017 NPA meeting. This year the group hopes to host a Future of Research symposium as well as pursue funding for the creation of an NYCPC website. 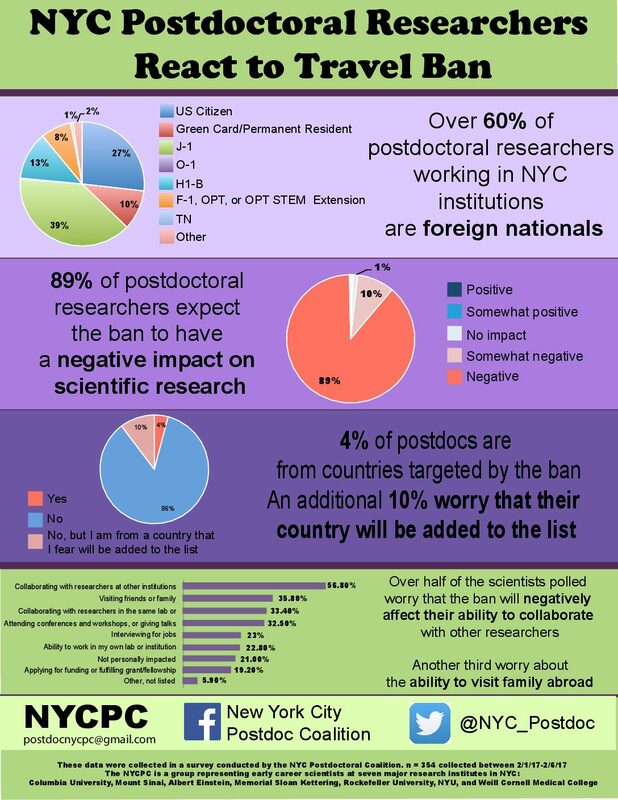 Most recently the NYCPC has conducted a survey to determine how many postdocs fall under the restrictions of the recent travel ban and how the postdoctoral community views these new restrictions. 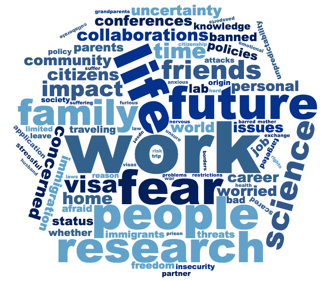 NYC Postdocs Respond to the Travel Ban: A survey conducted by the NYC Postdoctoral Coalition. By Yelena Bernadskaya, Ph.D. The recent travel ban has resulted in chaos as people were detained at airports and protests erupted against the ban. There is a general sense that the ban is targeting specific demographics without accomplishing the desired goal of protecting US citizens from terrorist threat. While many lives are directly affected by this ban, scientists are in a unique position. Many researchers travel to receive training or to attend meetings outside of the country, an essential way to disseminate their work and gain experience. Due to this collaborative, international nature of scientific research, the ban reverberates beyond those immediately affected and extends to the general scientific community. To gauge the number of people affected as well as to take the temperature of the scientific community regarding the ban, particularly that of postdoctoral researchers, the New York City Postdoc Coalition sent out surveys to some of the major research institutions in NYC asking for their reaction to the travel ban. The anonymous survey collected data regarding researchers citizenship status, their view of how the travel ban will affect science as a whole, and how the ban would interfere with their own research. It also provided an opportunity to make general statements regarding the ban for those that wished to do so. Postdocs are early career researchers and as such have an interest in the direction science research in the US is headed. Over 300 early career scientists responded to the survey. Of these, 89.4% held a postdoctoral position, with a small percentage identifying as grad student, faculty, or other research positions. 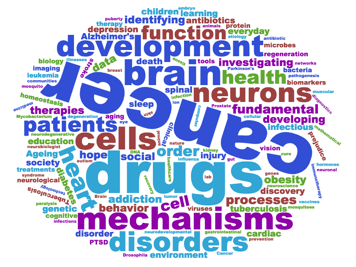 The responses came from a wide variety of disciplines and represent researchers working in many fields (Figure 1). Figure 1. Fields of research NYC postdocs engage in. The word cloud was generated from the survey responses. 4% of respondents were citizens of the seven countries that currently fall under the ban. However, the ban has had an affect on other researchers, as another 10% expressed concern that their countries will eventually be targeted as well, betraying a sense of agitation permeating throughout the research community. The stress of this has taken a toll on the researchers; in particular, 36% have expressed worrying over the ability of scientists to visit friends and family abroad. “Thinking about whether I will be able to see my wife, son and parents again and being cornered to choose between my career in the states and going back to be able to see my family is excruciating” says Bassem Shebl, a postdoc from Rockefeller University. “I am too scared to attend my brother’s wedding in Pakistan,” says Usama Syed of Mount Sinai. This sentiment is echoed even by those not directly affected by the ban (see infographic above). Only 37% of respondents held US citizenships or green cards, although data was not collected on how many of the citizens were naturalized immigrants or held dual citizenship. Over 60% of early career scientists working in NYC held visas such as J-1, H-1B, or F-1 (see infographic). This underscores the importance of international scientists to the work being carried out in American universities. 57% of responding researchers felt that the ban would make it difficult for them to collaborate with scientists abroad and 33% said it will make affect their ability to work with people in their own group. Others worry about the ability to attend conferences, crucially important for a scientist just starting out (see Figure 2). Figure 2. Words that come to the mind of the postdocs when thinking about the travel ban. As a group, postdocs feel the ban will hurt science overall. Almost 98% of researchers believe the general effects will be negative. This sentiment held in all fields of research, as the respondents ranged from those working in biomedicine to social sciences. Those that do not worry on a personal level are none the less concerned about being able to attract students, “I will be starting a faculty position next year and am deeply concerned about the ban impacting my ability to recruit talented students and postdocs to my lab” says Amy Orsborn, a postdoc at NYU. “This negatively alters the academic environment we all inhabit,” says Charlene Cruz-Cerdas, another NYU researcher. The survey was sent as a response to mounting worries of how limited mobility of scientists will affect the research being done in the US. The results point to a potential brain drain, as fewer immigrants would choose the US as a place to study and work, hurting the scientific enterprise as a whole and potentially weakening the US stance as a leader in the scientific community. We thank Jason Dumelie (Cornell Weill Medical College), Yalda Moayedi (Columbia University), and William Chang (Albert Einstein College of Medicine) for collaborating on survey design. We thank those above as well as Sonali Majumdar (Memorial Sloan Kettering Cancer Center), Alison Sanders and Delaine Ceholski (Mount Sinai Medical Center), for feed back and discussion of the manuscript and infographic. The NYCPC is a group representing early career scientists at seven major research institutes in NYC: Columbia University, Mount Sinai, Albert Einstein, Memorial Sloan Kettering, Rockefeller University, NYU, and Weill Cornell Medical College.